One of the most commonly used schemas is 'Product'. 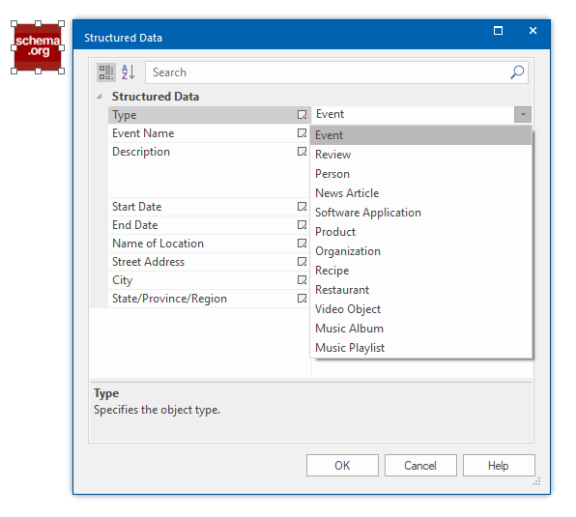 Select 'Product' in the 'Type' property. Note that the other properties are updated based on this selection. Now you can enter a brand name (for example, company name), product name, a description of the product and other values. WYSIWYG Web Builder includes definitions for frequently used schemas. It does not include all possible properties because we think that would make the tool too complicated for 'standard' users. However, it is possible to modify the schemas yourself. The definitions are loaded from the file 'richsnippets.json' in the Program Files folder in JSON format. This file cannot be modified in this location because the file is protected by Windows. But you can create a customized version of the file by copying it to the Documents\WYSIWYG Web Builder\system folder. In that case WWB will load the customized file instead of the default version. Be careful when editing the file, because even the smallest mistake in the code (like a missing comma or quote) may impact the functionality. Each schema has different values. In most cases, when you select a property the tool will display a hint for the expected value in the description field. For example, if you select 'Price Currency' then the description field will display 'USD, EUR, GBP'. Don’t place ratings on your homepage. Google states: “Review and rating markup should be used to provide review and/or rating information about a specific item, not about a category or a list of items. For example, “hotels in Madrid,” “summer dresses,” or “cake recipes” are not specific items. Make sure the rating values are realistic. Using 5 star ratings for all your products may not be believable. Even after adding structured data to your pages, it is up to Google if your data is visible or not. Also note that it may take a couple days (or weeks) before Google finds the structured data on your website. This is a relative new tool for WWB, so we will continue to improve this functionality in future updates based on user feedback. In this snippet, a picture of a milkshake is added, you can see the rating of the recipe, the time it takes to prepare the milkshake and other information. Why are rich snippets useful for SEO? Rich snippets stand out from the other search results. They look nicer, the user will instantly know more just by looking at them, and they have a higher click-through rate. How to add rich snippets to your web site? 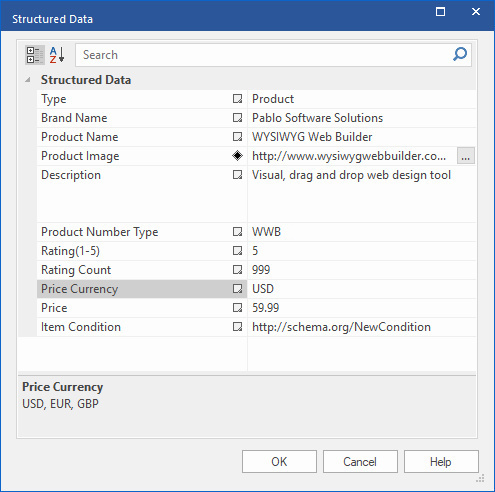 WYSIWYG Web Builder has a dedicated object to add rich snippets to your pages: Structured Data. The Structured Data tool generates JSON-LD code (schema.org) and automatically adds it to the page!